Ranveer Singh goes into fanboy mode as he discusses his childhood idol and Kill Dill costar Govinda, his bald pate for Bajirao Mastani and just why people advised him against it. 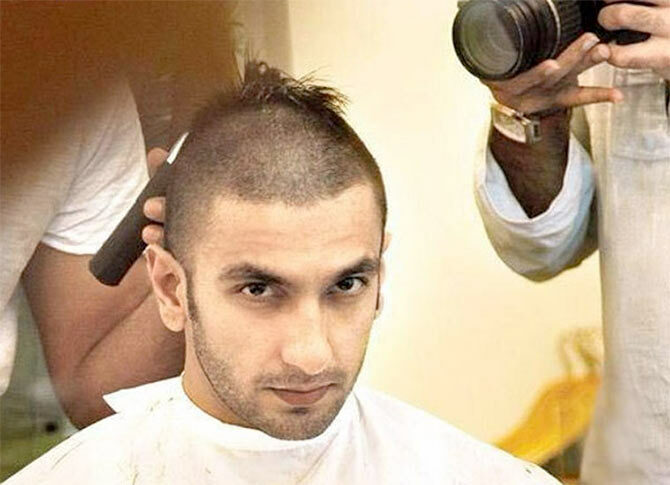 "I am very happy with my bald look," says the ever energetic Ranveer Singh as he removes his hat and scratches his head in jest to reveal his shaved head. The actor's new look is for his upcoming film -- Sanjay Leela Bhansali’s Bajirao Mastani. The actor has decided to devote an entire year to the film and says if his risk works, the film could go down in history of Indian cinema. But that isn't the only reason why the 29-year-old is chuffed. For now, it's all about Kill Dill, up for release this Friday, November 14, in which he teams alongside Govinda for the first time. You have shaved off your hair for Bajirao Mastani. How do you feel about that? I was nervous on the way to my mundan, but once it was done, I felt very liberated. I started feeling like I was another character. It was supposed to happen much later, but I begged Mr Bhansali (Sanjay Leela Bhansali) to allow me to do it earlier because it allowed me to live with my bald look longer and help me get used to it. I am very happy with my bald look. Were you told by other people not to do it and take this big risk? I told them that I was aware it was a huge commitment... first go bald, and then give a year's time when you can make three films. But I know if this works, ithihas bana dega (it will create history). Is this the most extreme thing you have done to play a character? I don’t know, but I like to play diverse characters and luckily I have been able to do so. I should look and feel different as that’s my job. I don’t like actors who repeat themselves. You get into a habit and then you know what you can expect from that actor. For me it’s more exciting to watch actors who aren’t predictable. I would count it an achievement if people said that they weren’t watching Ranveer Singh on screen but watching a character. Does the role start affecting your personal life? Yes. As I said, I usually start living all my characters for real. I remember my father and I had gone out for dinner and he told me that I was behaving seriously. I mould myself to the character. I have worked very hard for Bajirao’s character. I had to imbibe his body language, talking and walking style. After all, he was a statesman. Ram Leela was just a warm up for Bajirao Mastani. This is a much more difficult character. I have to put my 100 per cent into Bajirao’s role. You said you don’t like actors who repeat themselves but your favourite actor Govinda has done the same thing for years. (Thinks) I don’t think Govinda did the same thing. I think in the same zone Govinda gives you so many different flavours through his performance that he cannot be categorised. Most of his films had him dancing, doing comedy, action sequences, and emotional drama so it was like a complete package. I have seen some of his films more than 50 times. I have seen all his songs. I don’t love all of his movies but I love him. He is an icon. I am excited about Kill Dil because of him. He is so menacing in the film and he has done such a character for the first time in his career. How was the experience of working with him? That is sone pe suhaga of Kill Dil. He is a legend. No actor from yesteryear or the current lot can match his abilities. He is a genuine all-rounder. He is, according to me, one of the most talented actors to have ever graced the Indian screen and the most talented actor of his time. I would rate Govinda amongst the best performers in the world like Daniel Day Lewis, Al Pacino, Robert De Niro…I'll put Govinda up there. The fact of the matter is they can't do what he can do. You give Govinda a director like Martin Scorsese and see what he can do. Govinda is a master class. I don’t know why he doesn’t do more films. He is just mesmerising. When he comes on the sets he doesn’t know what you are shooting for that day and he doesn’t even care. Shaad will explain the scene. I remember he must have not given more than two takes in the entire film. You won’t be able to take your eyes off Govinda in Kill Dil. There’s a lot of talk about your looks in Kill Dil. I wasn’t sure about my looks in Kill Dil. I don’t have great facial features, especially my bulbous nose. Normally, because of my moustache, my nose doesn’t look prominent. But Shaad wanted me to be clean shaven in this movie. He wanted me to look like a baby-faced assassin. He wanted me to soften up so I had to put on a little weight, which was difficult. Over a period of time, with me maintaining my fitness level, my metabolism has spiked so now it's difficult to put on weight. When you put on a little weight your face doesn't look as hard… there's a roundedness to your cheeks. Parineeti: Ranveer is completely shameless!